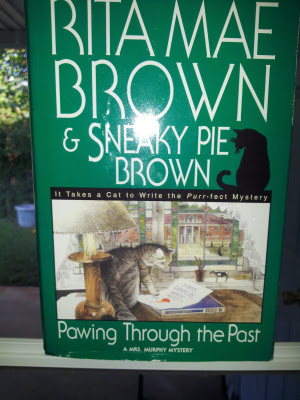 Pawing through the Past is feline and canine detectives, Mrs. Murphy and Tee Tucker’s, eighth cozy mystery. This time around, their ”mother," Mary Minor “Harry” Haristeen, stresses herself over her upcoming twentieth high school reunion. The class of 1980 are trickling back to the small town of Crozet, in preparation. For them, it's time to catch up with one another, share memories, and find themselves on somebody's hit list. And however dreadful as that appears, it’s only about as burdensome as Harry’s role on the reunion’s organization committee. Nevertheless, with her alumni finding themselves plucked off, Harry and her pets take it upon themselves to investigate which 1980 Crozet High graduate is behind the killings. The old saying of "the more things change, the more things stay the same" is just about right for this case. And Brown does the “change” with a literal and almost unforeseeable twist. And Pawing through the Past played with various directions. Some, I feel, if I list it’ll give away the entire book. So for the sake of remaining vague, Pawing is a vengeance story told through the familiar social commenter filter (usually expressed by the animals) known in Brown’s material. And that pushing filter couldn’t be truer here. However, just for a brisk lap, think about what happens when you bully someone too far. Think about how that experience sticks with and changes a person until he or she becomes consumed by it. I really wish I could say more, but I’m biting my lip because it’ll give everything away. There’s a twist about the culprit–and one that I suspected almost instantly. That doesn’t change how fun, humorous, and crazy the book was, though.